Welcome to Tenakee Springs on Chichagof Island in Southeast Alaska! Your guide is Tuck Harry and he has been doing what he loves since the 1970's! Chichagof Island is a beautiful emerald island located between Juneau and Sitka, Alaska, and is the home of Fishing Bear Charters. The Teneakee Inlet is a 26 mile long sheltered waterway on the east side of Chicagof Island and the waters are as calm as those of an inland lake! One of the unique things that they do when we do fishing in the Tenakee Inlet is fish for both salmon and halibut at the same time. We troll at greater depths and so are able to attract both the king salmon and halibut using the same bait. They also use the traditional stop and drop method for halibut. Using either halibut jigs or herring for bait, targeting the specific habitat for the prized fish. 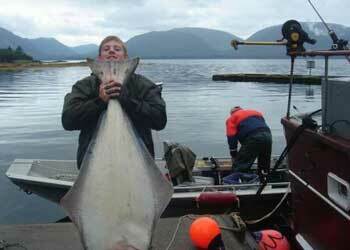 Halibut fishing usually runs from about June 1st to September 15. The limit is one halibut per day per person. The regulation is in place to conserve halibut and the sustainability of the fishery. Fishing Bear Charters is the premier provider of Alaska Salmon Fishing, Alaska Halibut Fishing, Alaska Kakaying, and Alaska Whale Watching tours. Be sure the check with them when you are thinking about a fishing or sporting trip or a vaction in the beautiful state of Alaska.